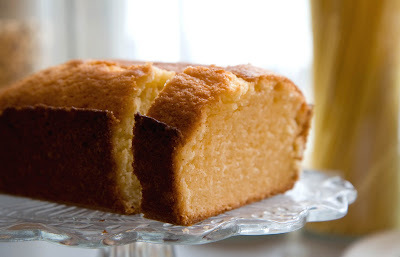 Every now and then, I get a craving for a simple butter cake. One without any accoutrements to distract from the rich buttery and vanilla scented flavour. Here's a recipe from Tana Ramsey (wife of Gordon Ramsey) which I've adapted to suit my taste. I've used the same recipe for cupcakes and it turned out well. The cake is moist and has a lovely texture. 1. Heat oven to 180C/fan 160C/gas 4. Beat together the butter and sugar until pale and creamy, then add the eggs, one at a time, slowly mixing through. Sift in the flour, then add the lemon zest and mix until well combined. Line a loaf tin (8 x 21cm) with greaseproof paper, then spoon in the mixture and level the top with a spoon. 2. Bake for 45-50 mins until a thin skewer inserted into the centre of the cake comes out clean. Will keep in an airtight container for 3-4 days, or freeze for up to 1 month.